The HP364 ink cartridge is one of HP’s biggest sellers as it runs in over fifty different HP printers. This popular set of ink cartridges comes in five colours black, cyan, magenta, yellow and photo black. Many of the printers using these cartridges are all in one – printer, copier and scanner. The fact that they use five individual cartridges mean that it’s easier and more cost effective to replace one ink cartridge at a time. 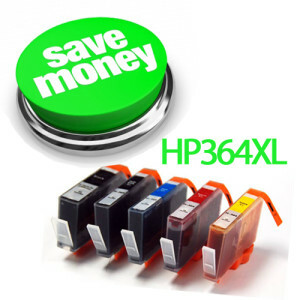 The original brand HP364 cartridges are available in two types, the standard and high capacity that is commonly known as XL. The standard ink volume in the original brand (OEM) set of HP364XL cartridges is approximately 25ml. The cost of a set of cartridges varies but the standard set is around €60 and the XL version can retail at around €90. The compatible version of the XL cartridge on average contains 77ml of ink that’s over 200% more than the original brand ink! The compatible version can be purchased for as little as €18.99 + VAT with low cost next day delivery. That’s savings of around €70 on a full set of inks! Generally speaking the HP printers will accept the compatible cartridges providing that they are fitted with the latest generation ‘chips’ are recognised by the printer. Customer feedback indicates that there is very little difference in quality between the original brand cartridges and their compatible counterparts. The compatibles are proving very successful and offering big savings to home and business users alike. When the compatible HP364 ink cartridges are first inserted it’s likely that the printer will indicate that they are either non-original or non-HP inkjet cartridges. The user just has to click OK and the printer will proceed to work with the cartridges. From time to time HP may offer a ‘Firmware’ update download designed to improve the running of the printer, it’s up to the user if they accept this download or not but customer feedback suggests that following the download compatible cartridges begin to give trouble with cartridge recognition. Taking into consideration the difference in cost between the compatible HP364XL and the original brand version, this is usually enough to make the consumer thinking about making the switch. The second factor is the amount of ink that is contained in the compatible version (they are filled to capacity) and this combination of price and ink volume is a viable reason to switch to the non-genuine cartridge. If in doubt always contact your ink supplier for advice and reassurance on what to do if there are any issues with your cartridges.